The birth of gravitational astronomy creates a new focus on general relativity, and presents enormous opportunities, and a substantial responsibility, for educating the public on discoveries that will change the way we view the Universe. OzGrav embraces these opportunities, through its national Education and Public Outreach (EPO) program – for the general public, for schools, and for eager citizen scientists. OzGrav researchers work with numerous outreach partners, including the Gravity Discovery Centre (GDC), a spectacular $10 million dollar, 1500 m2 outreach facility, co-located at the Australian International Gravitational Research Centre (AIGRC) in Gingin, in Western Australia. The Gravity Discovery Centre houses exhibitions on black holes, cosmology, fundamental physics and technology, lecture theatre, and a major public astronomy facility. We are developing new outreach programs and materials for use across all of OzGrav's research nodes. 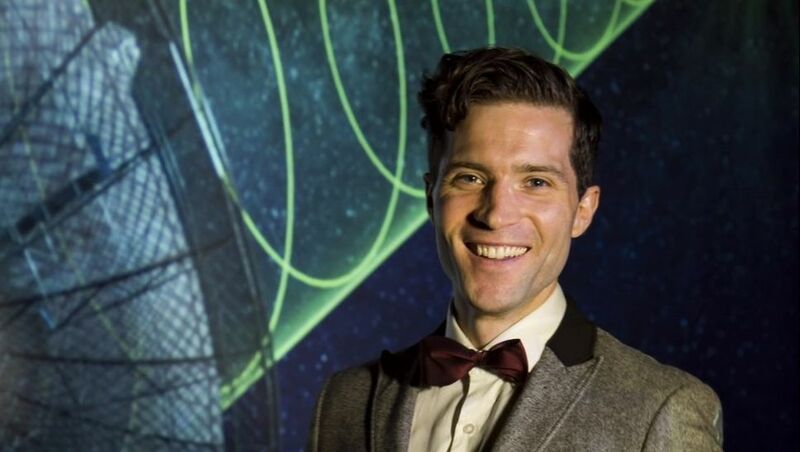 We are producing short animations, videos and social media content to make gravitational wave physics more accessible to schools and the general public. Please contact epo@ozgrav.org with any educational or outreach requests. If you are outside of Victoria and interested in our programs, please contact the OzGrav Education and Public Outreach Coordinator at jbondell@swin.edu.au. Take a trip in virtual reality to study the stars! Mission Gravity! combines classic scientific modeling with immersive virtual reality. In this incursion, students will collaborate in teams to create a model of stellar evolution by collecting and analysing data from a virtual trip to nearby stars. Students will use the laws of physics and the freedom of virtual reality to learn about how stars change over time and the tools scientists can use to study stars. Mission Gravity: The Life of a Star (45 - 60 min) - In this qualitative version of Mission Gravity, students collaborate to use VR to build a conceptual understanding of how stars evolve over time and how the stars’ features change. They will use observations to model the basic evolution of a star. Best for Years 6-10; $8 per student. OzGrav will also host teacher workshops related to our schools program as well as other modern physics and astrophysics topics. These will provide professional development opportunities for teachers to learn new content and design ways to incorporate it into their classrooms. Are you interested in learning more about the OzGrav Schools and Teachers’ programs? Subscribe here to receive updates when OzGrav is launching new programs! (We promise to only use your email for good… that means will will only occasionally send you updates when we have new programs to share)! Programs currently available in Victoria and testing in other States in 2019. 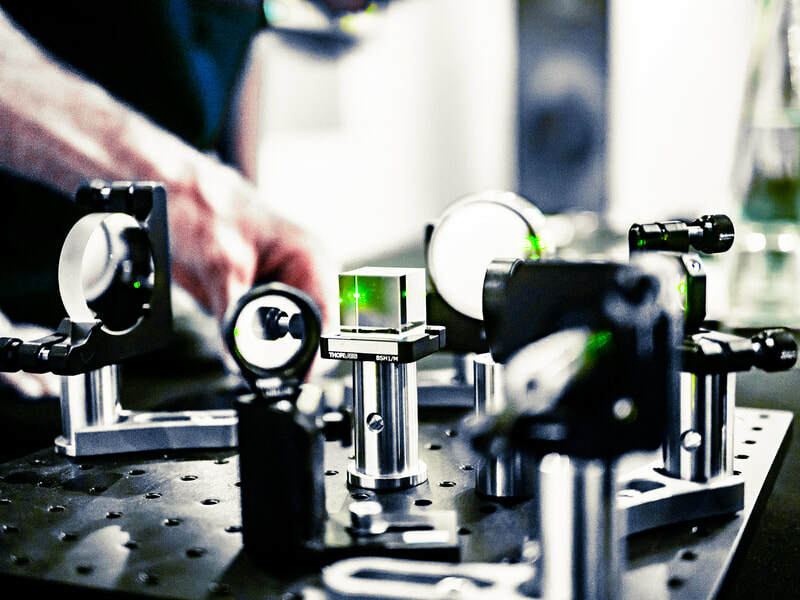 Adelaide’s Mini Interferometer for Gravitational-wave Outreach (AMIGO) is a tool used to demonstrate the principles of laser interferometry and gravitational wave detection. 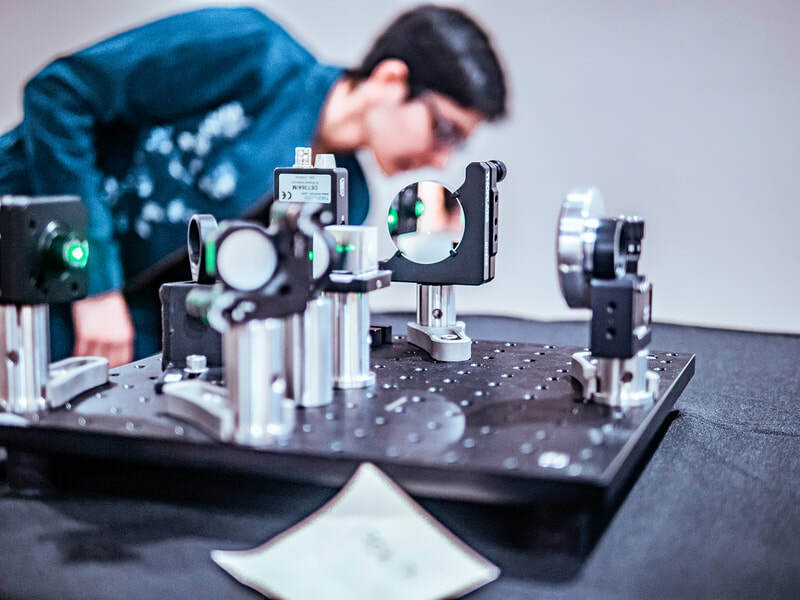 By visually demonstrating the interference of light and the sensitivity of Michelson interferometers, AMIGO allows us to connect with the general public in new and exciting ways. AMIGO is coming to more Australian states in 2019. 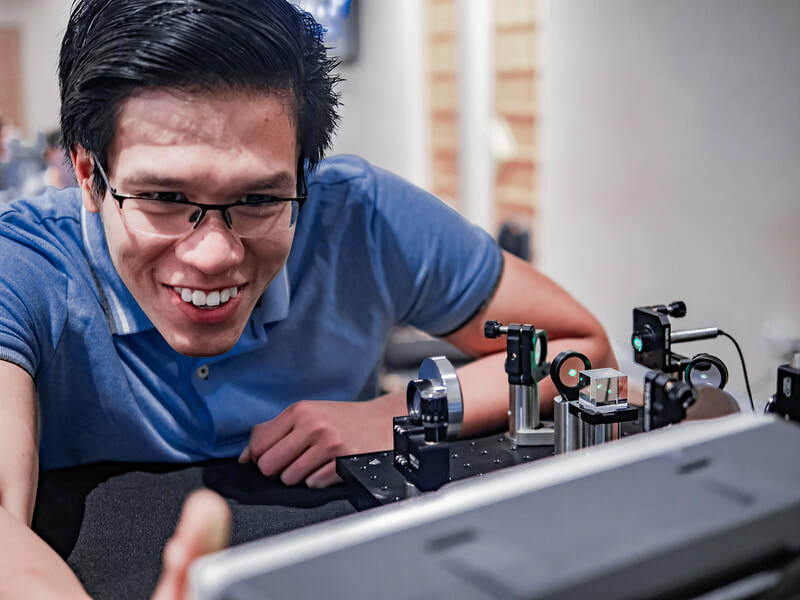 AMIGO has been developed with support from the University of Adelaide (UoA) School of Physical Sciences, UoA Faculty of Sciences workshop and the Australia National Fabrication Facility Optofab node. 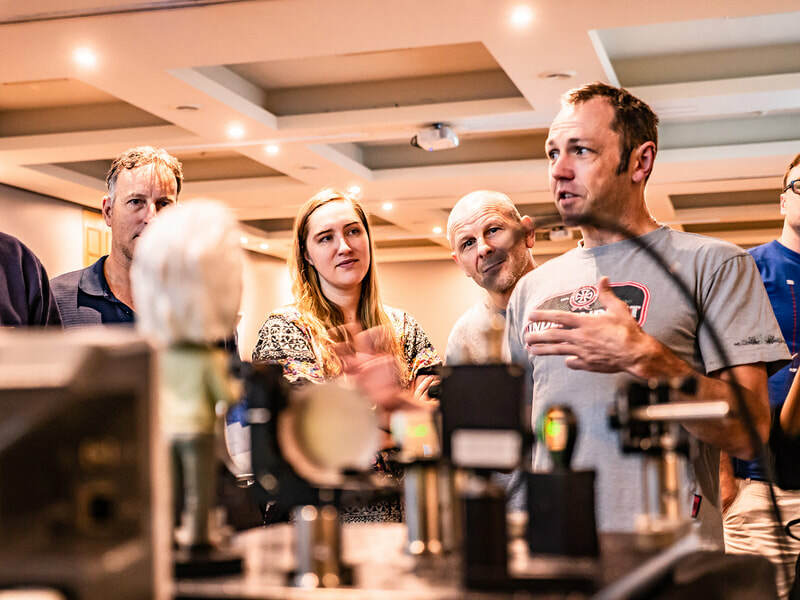 OzGrav Annual Retreat demonstration for researchers and outreach staff, 8 Dec 2018. At early ages we concentrate on a few key questions like what is space? what is time? what is light? and what is gravity? Our goal is to open the minds of both children and teachers to the fact that a) there are answers to the above questions, b) the answers are not trivial and c) in most cases the answers are different from those taught by most teachers. To understand space, we focus on geometry and arithmetic with questions like what is a straight line? Once we have explored the concept of a straight line we are ready to do experimental geometry on different surfaces. Through simple experiments (like using upturned woks to explore the geometry of triangles!) students discover that the laws of geometry depend on the shape of the surface. At Year 7 levels and above students enjoy learning that the standard formulae of geometry are only approximations because space is curved. Students are entirely receptive to the foundational ideas. Knowledge testing before and after interventions show that student learning outcomes are independent of their prior knowledge. Girls attitudes to science improve more than the boys, from much lower prior attitudes to near equality with the boys after the programs. Book us to come to you! We have outreach teams in Victoria, ACT, South Australia and Western Australia, and we are happy to travel across Australia. Please get in touch via epo@ozgrav.org with any special requests. Take a trip out into the solar system with a virtual reality headset. Learn about planets, stars and gravitational waves, but don’t get too close to a black hole or it might turn you into spaghetti! $10 per student for a maximum of 30 students. Travel through the universe in virtual reality! Get up close to planets, stars, black holes, and gravitational waves and learn how scientists study them. $10 per student for a maximum of 30 students. Students collaborate in science investigation in which they travel to stars in Virtual Reality and use tools to collect data to study stars and how they live... and die! $10 per student for a maximum of 30 students. Take a trip out into the solar system and beyond in a virtual reality headset! OzGrav’s amazing VR system takes six people at once to a virtual universe full of planets, stars, black holes and of course, gravitational waves! Visitors are guided by experienced scientists to the planets, stars, and far reaching galaxies to the most extreme objects in the universe. Great for Open Days, Fairs, Festivals and Expos. Cost TBA. Pitch in and help LIGO scientists on the search for gravitational waves. Join the Zooniverse project and classify "glitches" - noises or errors in the data collection from equipment or the environment. These classroom materials focus on key science concepts introduced in the SciVR app. The app is free to download, and can be used in headset mode (double screen) or non-headset mode (single screen). Give students the opportunity to learn more about the scale of our solar system and how different the planets are from each other. Presentation and activities. The light we see from stars tells us a lot about them. Use this activity to show students the connection between the colour of stars and their properties. What exactly is light? Explore the entire spectrum of light. How do we know where things are in space? Use this activity to explore what astronomers call signal localisation.